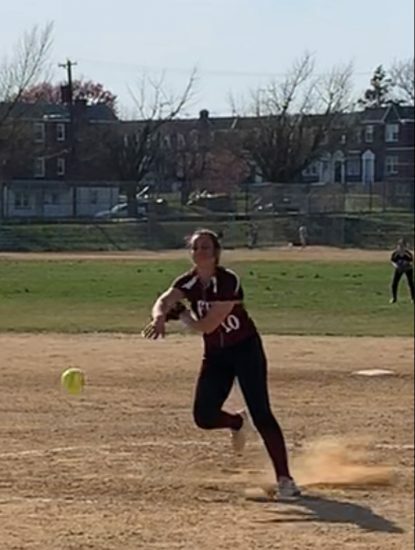 It was the season opener in Catholic League softball on a chilly March 26, and Little Flower trailed visiting Archbishop Wood by four runs with two outs and the bases empty in the bottom of the seventh. In other words, the game was basically over. Two batters later, junior infielder Mackenzie Paxson temporarily took the Sentinels off life support with a two-run homer. Then junior pitcher Ginny Britto smacked a double. Up stepped first-team All-Catholic shortstop phenom Courtney Sherwood. Sherwood rewarded her coach’s faith by smashing a two-run homer over the center field fence, and, incredibly, the game was tied. Little Flower’s bench went ballistic. The fans that had remained screamed their support. You could only imagine Little Flower’s collective reaction when Paxson laced a double that scored Britto with the winning run in the bottom of the ninth for a surreal 10-9 victory. With more than one-third of the league season complete, Little Flower has established itself as a threat. An 11-7 win over visiting Conwell-Egan marked the first time in decades that the Sentinels had defeated perennial stalwarts Wood and Conwell-Egan in the same campaign. In their defeats, the Sentinels lost 6-5 to Lansdale Catholic, 8-1 at St. Hubert, and 10-8 against Cardinal O’Hara. Those three squads have a collective record of 14-3. Important to note that in the loss to St. Hubert, the Sentinels led, 1-0, heading into the sixth inning before the Bambies meticulously tallied eight runs for a misleading margin of victory. “We have been a strong hitting team and have many key hitters in our lineup,” said Sherwood, who has hit three homers this year and seven in her career. “Every game we’ve been in it to win it, and all the games have been relatively close. “There are a lot of positive vibes on our team, and to me, it doesn’t matter who we play because we’re a team and we should be able to beat any team. It shouldn’t matter even if you know you’re not better than the team you’re playing, because you should try and win every game with a positive attitude. The composite record of Little Flower’s seven remaining opponents is 14-23. If the Sentinels can maintain their momentum, it will be unnecessary to participate in a pre-quarterfinal game.